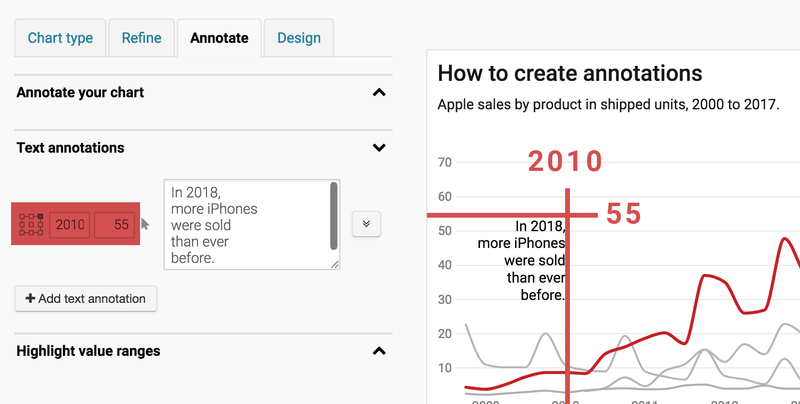 In the "Annotate" tab in step 3: Visualize, you have the option to create text annotations for line charts and scatterplots. Here we show you how to create these annotations and what to pay attention to. This article will explain the basics of our annotation tools. You're already a pro and have used the tool many times? Then still consider having a look at 4 Alignment and 8 Offset. We've made the experience that even long-time Datawrapper users can be surprised with these options. If you want to add another annotation, click on " +Add text annotation". Here you decide what your annotation should say. Annotations can have many use cases: You might want to replace the labels of a line chart, or explain why a chart looks like it does at a certain place. The text field does not understand HTML commands (like <b> or <br>), but you can create line breaks, just with pressing "enter" in the text field itself. Your final chart can have emojis, so do go crazy with that. On a Mac(Book), you can choose emojis with pressing crtl + cmd + the space bar. You'll not just find fun emojis 😎🎉🌴, but also simple symbols like arrows and long lines ↑↓↘︎←│▶︎ that can make it easier for your reader to understand what your annotation is referring to. After placing your text annotation with the little mouse cursor (3), you will be able to adjust the position precisely. The first value is the value on the x-axis (on line charts, that's usually a date) and the second value is the value on the y-axis. Here you decide how the text should be aligned. That's especially important when using multiple-lined annotations or the "offset" setting (8). The question the Alignment feature answers it: "Where is the precise position (3) in relation to the whole text block?" Every one of these nine little squares is a possibility. If you have an annotation with multiple lines and want it to be left-aligned, choose one of the three little squares at the left. If you want your annotation to be right-aligned, choose the squares at the right. And you will achieve a center-aligned annotation with choosing any of the three squares in the centre. Here you can decide if the entire annotation should be in bold, italic, underlined or should have a specific text color. For the text color, consider taking the color of the chart element you want to explain. For example, if you want to make a statement about a red line ("This peak in 2014 is due to x"), then consider using the same red color for your annotation. Here you can use the buttons + and – to increase or decrease the text size of your annotation. The text size will be displayed between the + and the –. That's helpful if you want to give another annotation the same text size. In general, try to not have too many different text styles and text sizes. Try to reduce them to two different text sizes and two different formattings. The offset feature might seem a bit hard to understand, but you'll find that it's necessary to make sure that your charts look best on all devices; desktop and mobile. The offset setting makes sure that your annotations are always readable and have exactly the same distance to a line or another chart element that you want it to have. Finally, if you want to delete an annotation of yours, you can do this with the click on the red trash button.